We’re sorry that you’re having issues with Entanglement. We’re doing our best to address problems as we learn about them. Look below for a list of known problems and solutions. If your problem isn’t listed below or our solutions don’t work, please let us know by e-mailing us at feedback@gopherwoodstudios.com. Please include your browser, browser version number (found in the ‘about’ menu), and directions on how to recreate the error. Thanks! For any references to entanglement.gopherwoodstudios.com, click "Remove" to remove it. Reload Entanglement and it should load a version which will hopefully let you log in. The game board doesn’t show up when I load the game! Lucky you, you’ve accessed our unique invisible mode! It available only to especially talented individuals such as yourself. Actually, this could be one of two things. If it's the initial load of the game, try reloading the page or clicking in the game area to force the game to load completely. If that doesn’t work, a few Entanglement players have noticed that our game doesn't play well with some browser extensions like the StumbleUpon bar - if you have this particular extension installed, click the "x" on the far right of the bar and the Entanglement board should appear. If none of these work for you, please send us your browser information as that may help us figure it out. Sorry! The scores on the scoreboard are so high, they must be fake! Why do you think that? Are you jealous? Scores in Entanglement can get pretty high. Creating a really long line in one turn can rack up a lot of points. We are keeping an eye on the scores to watch out for cheaters. If we find an invalid score, we will remove it and send a e-mail to that person’s mother letting them know they raised a cheater pants. My scores aren’t being submitted on the high score boards! Are you logged into your Google Account? Your scores will not be submitted to the global score boards unless you are logged into your account. Did you score within the top 100 scores? Scores that are below the top 100 are not shown on the boards. Sorry. With a little practice I’m sure you’ll be in the top 100 in no time! Are you connected to the Internet? You can play the game offline, but your scores will only show up in the high score boards after you log in online. I ordered the expansion, but I can’t get access to the new games modes! Make sure that you’ve logged into your account at http://entanglement.gopherwoodstudios.com/. Clicking the key icon in the top right of the screen should log you in. 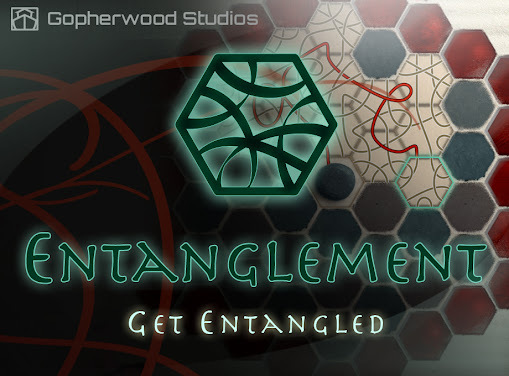 If you still don’t have access, please contact us at feedback@gopherwoodstudios.com along with the email address you use to log into Entanglement and we'll help resolve the issue. Thank you so much in wanting to experience more Entanglement. We’re doing everything we can so you have a positive, painless purchase process. If you have ideas on how to improve it, please feel free to let us know. Thanks! This game is so awesome, it caused my brain to explode! We’re sorry about your brain. Regrettably, we are game-makers not surgeons and thus can do little about your brain. For those who fear their brain may explode, we recommend wearing a headband or tight fitting hat while playing to maintain your cranial structure.